What's ahead for these red-hot companies in 2018? 2017 will be the ninth year of the bull market that started after the financial crisis, and the S&P 500 has now more than quadrupled from its lows in early 2009. Many individual stocks have seen more impressive gains, and even after a year in which major benchmarks are up about 20% or more, you can find several stocks that have tripled since this time in 2016. 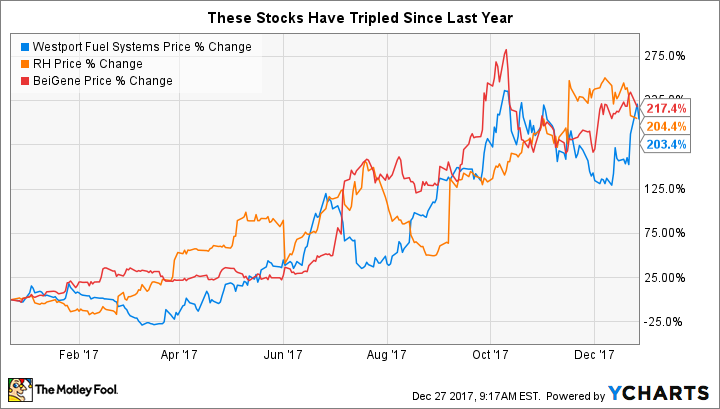 RH (NYSE:RH), Westport Fuel Solutions (NASDAQ:WPRT), and BeiGene (NASDAQ:BGNE) are among those stocks that have tripled in the past year, and investors want to know whether they have the capacity for even further gains in 2018. Let's take a closer look at these three companies and what's ahead for their thriving businesses. The company formerly known as Restoration Hardware has done a lot to try to revamp its image, including the shortening of its corporate name. Yet investors came into 2017 wanting to see RH restore solid stock performance after substantial losses in 2016. That's just what RH was able to do. Early in the year, the home furnishings retailer made it a point to express confidence in its stock, announcing a major repurchase program for its ailing shares after seeing solid holiday-season financial results. The year's biggest gains came in September, when RH said that efforts to reduce inventory, complete its transition to a membership model, and boost margin were largely successful and predicted further gains ahead. Another strong showing in December put the finishing touches on a great year for the retailer. From here, some investors are dubious about how much more upward momentum RH has. Nevertheless, if the economy continues to strengthen, then RH hopes that it can capitalize on financially healthy upper-income shoppers to add to the value of the brand that the upscale home furnishings specialist is trying to build. Westport Fuel Systems started the year on a sluggish note as the natural-gas engine technology specialist worked to integrate its operations after its merger with Fuel Systems Solutions. By the summer, those efforts were starting to pay off, and in Westport's second-quarter results, the company managed to limit its losses and post massive jumps in revenue. Strategic moves to sell off non-core businesses and concentrate on strengthening its balance sheet also showed the progress that Westport had made. The big future potential for Westport comes from its move toward the High Pressure Direct Injection 2.0 system that it's working to get customers to adopt. Many original equipment manufacturers will offer the HPDI 2.0 system, but the challenge that Westport will face is that with diesel fuel prices at relatively low levels, the incentive for heavy-duty truck buyers to switch to natural gas-powered systems isn't as large as it has been in the past. A slow adoption rate among end users could disappoint Westport investors in 2018 even if its long-term prospects are still encouraging. Finally, BeiGene went from obscurity to notoriety in one fell swoop near the middle of the year. The Chinese biopharmaceutical company attracted a major partnership deal with Celgene (NASDAQ:CELG) under which Celgene acquired the worldwide rights beyond Asia to BeiGene's BGB-A317 pipeline PD-1 inhibitor to treat solid tumors in the immune-oncology realm. In addition to a cash payment of $263 million that Celgene made, BeiGene also received a $150 million equity investment from Celgene. The true opportunity for BeiGene comes from the most unusual aspect of the partnership. As part of the deal, BeiGene got the rights to sell Celgene's blockbuster drugs Abraxane, Revlimid, and Vidaza exclusively within the Chinese market. The strategic decision shows how hard it can be to break into China's pharmaceutical industry for outside companies, and it demonstrated BeiGene's negotiating prowess in securing what could be a hugely lucrative deal in exchange for an admittedly promising yet still uncertain candidate drug. Even if BGB-A317 doesn't live up to expectations, BeiGene could still benefit greatly from acting as an entryway into China's healthcare industry. Few stocks are able to triple within a single year, and it's rarer still for big winners to keep up their positive momentum. Yet BeiGene, Westport, and RH all have ways in which they could further reward their shareholders in 2018 and beyond. If the conditions stay as favorable as they've been in 2017, then all three of these stocks could see further gains.